Amelia, my labor of love – updated for top down construction! 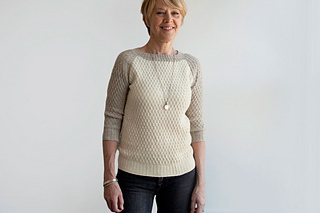 This two-color pullover with three-quarter length raglan sleeves, is worked entirely in seeded rib check – a most comfortable, squishy, and delicate fabric comprised of alternating knits and purls. You’ll find this piece is versatile and multi-season, well worth the enjoyable investment in its making. Top down construction allows easy modifications to length, as desired. Below the yoke, bodice and sleeves are knit in the round. • CC (collar trim and sleeves) – Audouin #157; 3, 3, 3, 3, 3, 4, 4 skeins, or for comparable yarn, approximately 510, 540, 600, 650, 680, 730, 790 yds / 470, 495, 550, 595, 625, 670, 725 m.
Cable and long-tail CO methods, circular knitting, decreasing (ssk, k2tog, p2tog, p2tog tbl), increasing (m1L, m1R, pfb), and brief seaming (at sides of each armhole). 11 page pdf includes pattern instructions, photographs, schematics, stitch descriptions and charts, definitions for relevant abbreviations, and a multi-set stitch pattern template to assist tracking of stitch sequences during shaping.